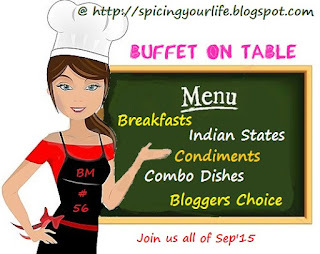 The 4th week of BM Buffet on Table, we are doing a week long breakfast across countries theme. Since i m already doing a A-Z on Breakfast all through this BM, i chose to make something interesting, do-able from Vietnamese cuisine. Vietnam food offers too many breakfast cakes and each of them is as popular and tasty as one another. Some most common cakes can be named as Bánh Chưng Rán, Bánh Giò, Bánh Khúc, Bánh Rán, Bánh Nếp, Bánh Tẻ, Bánh Đúc, Bánh Dày. For the last BM, Around the world in 30 days, i have made Bánh Bao. from vietnam, but that was a steamed bun. This Banh It tran is cooked in hot water and served with onion oil and dipping sauce. It is somewhat similar to our own kozhukattai, but only difference in making the dough and cooking it. Only the ingredient list and the name might sound so different and difficult, but it is pretty easy dish to make and you would definitely love the taste. Wash and soak Mung beans/Moong dal for 30 minutes. Pressure cook it until soft. It can be cooked on stove top too, just see to that it turns soft. Heat a pan with oil, saute the white part of onions first. When it turns soft, drain it using a slotted spoon and add it to the soft mung beans/moong dal. Add pepper and salt and mix it together, Divide the dal mixture into 5-6 portion. Keep it covered until use. In the same oil in which you sauteed onions, saute the green part too. After 3-4 minutes, take it off the stove and let it cool. Take the flour, add salt and mix well. Add water 1 tbsp at a time and make a soft dough. Do not get tempted and add more water. You might not need all of the hot water, you will require more than 1/4 cup, but less than 1/2 cup.Keep the dough covered for 10 minutes. Divide the dough into 5 or 6 portions. You can either roll it inbetween plastic paper/ziploc or do as i did. I took a portion of dough, flattened it in my palms, placed a ball of mung beans, brought the dough together and made it into a ball. Rolling the dough was a bit tricky, keep the dough covered all the time, Do not roll too thin, it might stick to the paper. In a pan, bring about 1.5 - 2 cups of water to rolling boil. To the boiling water, add 2 or 3 dumplings at time. See to that they don't touch each other, or else they might stick together. Keep stirring on and off. It takes about 8-10 minutes for the dumplings to cook. Once cooked, they float on top. Remove the cooked dumplings from the hot water, using a slotted spoon and put them in cold tap water. After 5 minutes, take it out, place it on a serving plate/bowl, drizzle some onion oil on top and serve it along with Nuoc Cham Chay - Vegetarian dipping sauce. Thus looks so much like our Indian version. I had made Vietnamese pancakes last year & that was lit similar to our dosa but with a different filling. Healthy breakfast & looks yummy. These dumplings looks so delicious and healthy. Awesome priya..what a lovely dish!..these dumplings surely makes the breakfast table look more sinful! What great dish. moong bean dumplings.. I need to explore more. Absolutely stunning Priya...I loved these dumplings, they are so so inviting with those beautiful clicks...love that onion sauce..yum ! Wow..Interesting Dumplings, looks so delicious, adding to my todo list. Wowwwing here, that last click is torturing me.. wat an awesome dumplings..drooling here. Amazing clicks Priya. Dish looks amazing. Moong dal stuffing gives the dish a very Indian touch. Looks yummy!! That sure is one guilt free and eye catchy breakfast. Different version of modak? Very interesting and healthy breakfast. Bookmarking this one. Love it to bits.